On the Way to London 2012! Shortly after he arrived home from New Zealand last February, Sam received a call from the Paralympic head coach. She said, “You’re on the team for 2012”. Sam was thrilled but he knew that the hard work had only begun. He knew that to go to London, he would have to throw the shot put 10.5 meters or more to stay on the team. And, he has. Sam heading to his next event. Except for a short break, Sam has been training. He threw the shot once or twice a week and filled in with aerobic exercise. 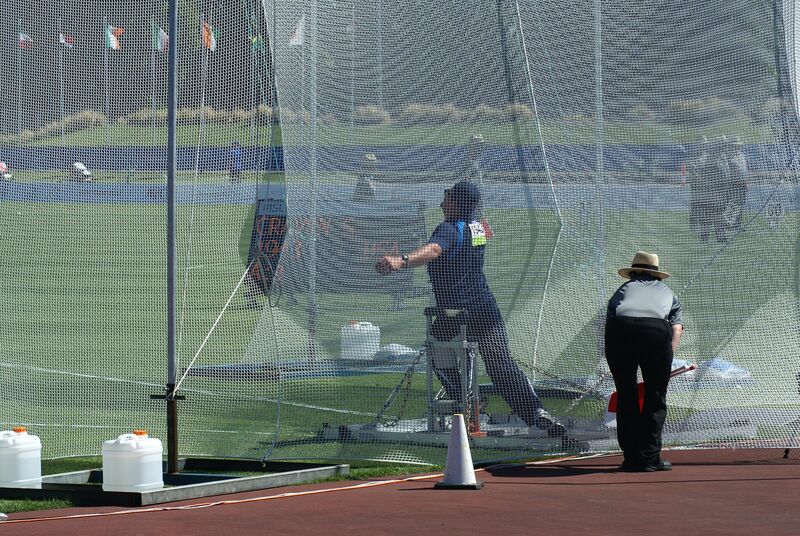 In late April, he traveled to the Olympic Training facility near San Diego for a week -long Throws Camp with the other Paralympic field athletes. The Paralympic coaches had him throwing for a couple of hours and then lifting weights for another three hours each day for most of the week. 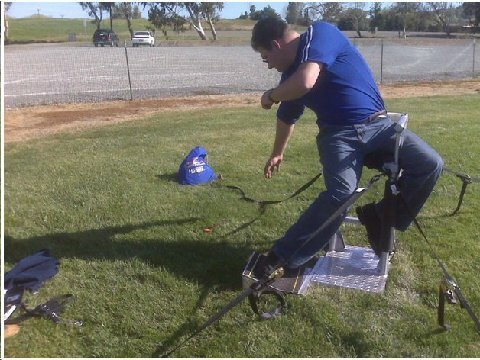 He then flew to Arizona for the Desert Challenge, May 6, where he threw the shot 10.56 Meters. At the US Paralympic Trials in Miramar, Florida (June 17) he threw the shot put 10.58 meters, won the gold medal for his class and further cemented his place on the National Elite “A” Paralympic team . With his sights set on 10.75 Meters, he returned from Florida Saturday, June 18 and flew out again Wednesday, June 22, to Calgary, Canada. Arriving after midnight Thursday morning he tried to get in enough sleep before his first event at 3pm that afternoon. 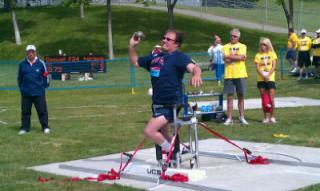 He started the Canadian meet with a personal best of 31.43 Meters in the discus, making the “B” standard. Discus is a challenge for Sam because of the tightness in his muscles but he continues to inch closer and closer to the 35 Meter “A” Standard. On Saturday, June 25, he threw the shot put a personal best of 10.82 Meters, setting a new US record and going beyond his 10.75 meter goal. The World Record for his class is only a little over 11 Meters, set in New Zealand in January. On the Monday before he left for Florida, he had a strong massage to loosen him up. Tightness is Sam’s biggest hurdle. Because of his Cerebral Palsy, using his muscles tends to tighten them up, becoming counter-productive. Stretching and a massage are critical to his success. For each competition, Sam goes through a training cycle, designed to get him to “peak” or throw his farthest at a particular point. He will rest, and then build up to an intense workout schedule about a week before a meet. He will then rest and try to get a massage immediately before a meet. This week will be a week off from training and then he’ll start his workout cycle. He will again throw once or twice a week and continue the aerobic training. With the Revolution just around the bend, hand cycling will be a big part of this next cycle. He will also add a Water Fitness class at Los Medanos college where he is a student, starting August 12 to increase flexibility and fitness. 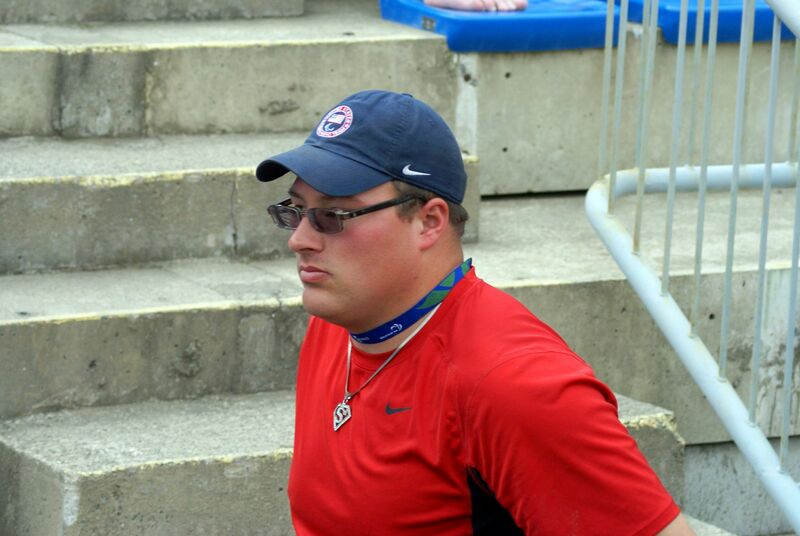 September and October may see Sam again on his way to Throws Camps in Chula Vista at the Olympic Training Center. In November he will travel to Guadalajara, Mexico, as part of the Paralympic Team participating in the Parapan Games. London is just a little over a year away. I never thought the sound hundreds of Sandhill Cranes could have an awesome affect on me! The Adventures & Outings (A & O) gang and I spent our day traversing meandering paths, both wooden and paved, around a small portion of the Cosumnes River in anticipation of hearing the Sandhill Cranes’ “trumpeting” song and seeing the huge birds in the sky. If one were to stand next to my wheelchair, I’d be able to pat him on the head and he would me reach me from six feet away with the tip of his wing. But, the skies were clear of their shadows all day, however, our excitement grew as we heard some trumpeting sounds in the distance. 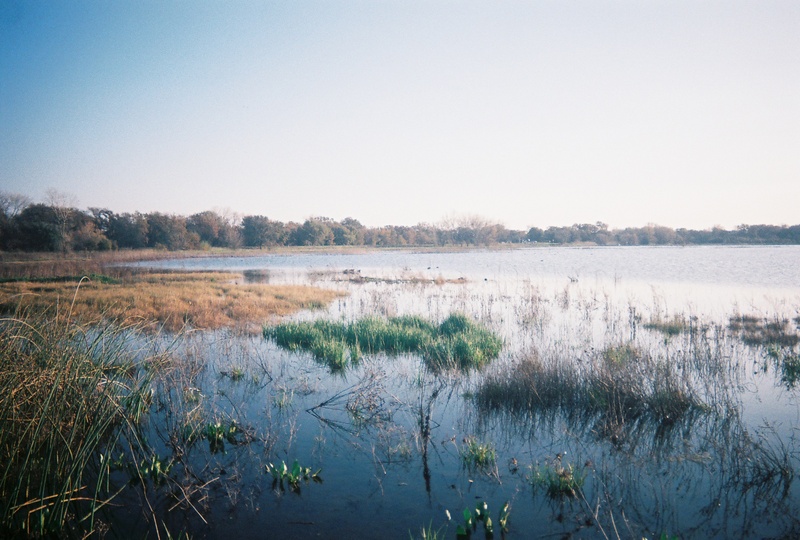 The moment quickly came when we had to pile back into our BORP bus, but that wasn’t the end of our “adventure.” Apparently, one of our adventurers found out where the Sandhill Cranes fly in to roost; it was only five hundred yards away. Dusk had fallen when we got to the roosting area. There was only a sliver of burnt-orange on the horizon. As we were amazed by the serenity of the sunset, we witnessed a flock of fifty or more Sandhill Cranes fly over our bus and land onto their roosting area. They continued to fly in flock by flock until an area the size of a couple or more football fields were filled. The Cranes’ bluish-gray plumage seemed to glow in the twilight. While the Cranes filled the roosting area, their trumpeting song enveloped the bus and left us enchanted. We were all awestruck by the magical moment of Nature’s tranquility. Adventures & Outings not only takes me out of my ordinary life, but it soothes my soul. There’s no better elixir! What a great start to the summer. We have had some great participation so far and I am really proud of the kids that have been working out so far. This week we started our Cross-Training program. James and Zach started the day off with an 18 mile bike ride, with Christie, Raejean, and Oscar riding 6 miles and Cortney getting in 4.5 miles to start the day. That was before basketball! Remember, every mile counts, every action counts, every day counts. We have some fantastic new classes appearing on the schedule. New classes, low fees, fantastic instructors, and an easy connection to public transportation, it doesn’t get much better than that. Here’s some of what’s on tap at the BORP Fitness Studio. Community Donation Yoga Class– starts next week, this is a donation based class and is offered twice a week, Tuesday from 9-10:15am, and Friday from 5-6:15pm. The class is taught by various instructors. Core Conditioning– Starting June 15th, offered on Wednesday from 12:15-1:15pm. Taught by Alicia Langlais. Post-natal Yoga– Starting on June 15th, offered on Wednesday from 11-12pm. Taught by Tricia Tangeman. Beginning Vinyasa Yoga-has started, offered on Wednesday from 5:30-6:45pm currently taught by Jen Martin, but will be taught by Jill Schinberg starting on June 29th. Intermediate/Advanced Vinyasa Yoga– has started, offered on Monday from 7-8:30pm. Taught by Jen Martin. Vinyasa/Power Yoga– Starts on June 17th, offered on Friday from 6:30-7:45pm. Taught by Sara Liberatore Lopez. Restorative Flow Yoga-Starts on July 11th, offered on Monday from 12-1:15pm. Taught by Traci Joy Burleigh. Yoga for Seniors-has started, offered on Monday and Thursday from 9-10am. Taught by Nancy Yates. Basic Yoga Postures-has started, offered on Tuesday from 5-6pm. Taught by Nancy Yates. Zumba, Cardio Strength, and Hot Stone Yoga are coming! Stay tuned. Always check the BORP website for details on classes here. Or visit our online scheduler for the most up to date info on class additions and/or cancellations. We are here to offer Every Body a path towards fitness and wellness.